Monty and Rose, two dark-brown Percheron draft horses, provide the muscle at Amethyst Farm on North East Street. They do the work tractors used to do: preparing cut hay in the fields, hauling manure to fertilize crops, even plowing the farm’s driveway during the winter. 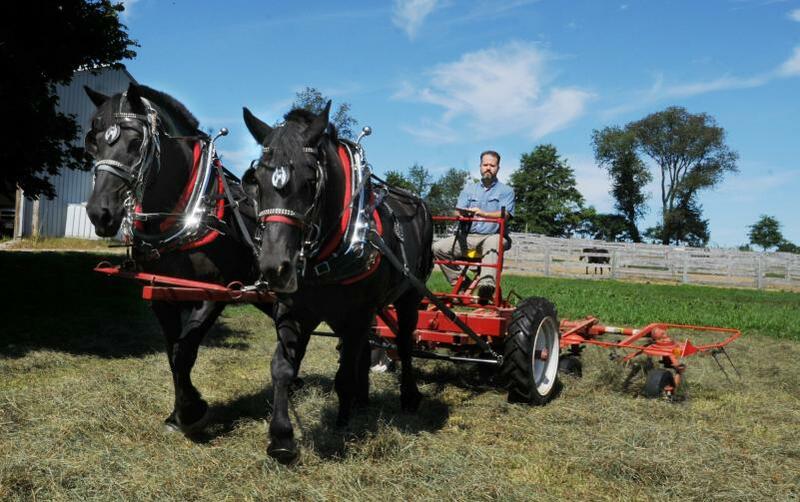 Brennan, 42, a former professor of evolutionary biology at Yale University, is one of a small but growing number of farmers who are returning to using horse power for at least a portion of their work. Brennan and his wife, Patricia, bought Amethyst Farm about 18 months ago. 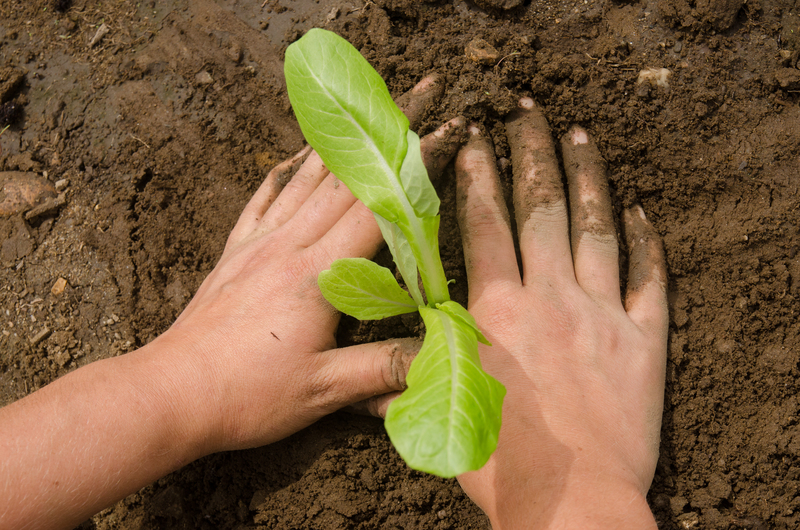 The couple, who have two daughters, had been involved in Community Supported Agriculture enterprises in both the New Haven, Conn., area and in New York state, and wanted to pursue community agriculture full time and year round, said Brennan. He quit his job at Yale, and Patricia Brennan was able to move her National Science Foundation-funded research in evolutionary biology to the University of Massachusetts Amherst. Amethyst Farm generally boards and trains between 15 and 20 horses at a time. Brennan thought it made sense to bring in draft horses to help with the farm work involved in the operation. Monty, 12, and Rose, 15, came to him from Muddy Brook Farm in Amherst where their previous owner, Barry Roberts, used them for carriage rides. Now Brennan has adopted two purebred English shires from Blue Star Equiculture, a draft horse rescue organization and farm in Palmer. Tiny Tom and Big Ben, 3-year-old geldings, are settled in their stalls and have begun a lengthy training period. “You want the stamina and ambition of a teenager, but the horse to be trained and calm enough to listen to you,” he said. Tiny Tom and Big Ben are the first horses Brennan has trained. He is starting out by teaching them when to start and stop, using a lead line. “It’s a lot of repetition,” he said. The next step will be to put harnesses around them and then bits in their mouths. Brennan said eventually he will be able to control the horses with only the bits. After that he will have them pull tires, eventually advancing to heavier and more complex equipment. Once Tiny Tom and Big Ben are ready to begin working the fields, Brennan said, he will pair them with his experienced horses so they learn not to startle. “It will take a few years to have a bomb-proof horse,” he said. Brennan happened to be looking for draft horses when Tiny Tom and Big Ben became available. “There seems to be a lot of serendipity involved,” he said. They were among six horses that came to Blue Star from Long Island following the death of their owner. Pamela Rickenbach, Blue Star’s executive director, said her organization takes draft horses which have been abused or whose owners can no longer care for them, and places them at farms where they will be able to work. Though healthy and large, Tiny Tom and Big Ben were still in danger, Rickenbach said. “These babies had only been halter-trained. They haven’t been trained to do anything else yet, and in this economy, a horse without a job is at risk, as these horses were,” she said. Rickenbach said thousands of similar horses end up in slaughterhouses. “We can do far better for our horses,” she said. She expects the geldings to fit in well at Amethyst Farm. “Big Ben and Tommy are going to grow up in an environment where they can participate in the life of their farm and the life of the community,” she said. Two other horses rescued from the same owner, Merlin and Foxy, will be used for carriage rides around Independence Hall in Philadelphia, Pa. The remaining two are at a foster home awaiting permanent placement, Rickenbach said. Justin Morace, Blue Star’s co-founder, said having Tiny Tom and Big Ben at an Amherst farm is ideal, since it allows him to check on them and participate in their training. Morace is also an instructor at the Stockbridge School of Agriculture’s Draft Horse Husbandry Program, which last year taught more than a dozen students how to use horse power. Nell Finnigan, who graduated from UMass last year, now works at Blue Star, which is also a working farm. She uses the horses for plowing and harrowing, spreading manure and hauling the harvest. Finnigan said the draft-horse movement is burgeoning among young farmers, and added that she was “totally smitten” by the idea even before taking the class. “Draft-horse power is sort of a romantic ideal,” Finnigan said. She said UMass is one of the few places where students can work with draft horses. “It’s changed the course of my agricultural career,” she said. Brennan said a farmer has more control when using horses as opposed to tractors. The animals have a larger range, he said, and are a “modular” source of power, meaning that they can be added or subtracted from the equipment depending on the rigors of the job. His horses eat hay grown at Amethyst Farm, provide fertilizer and have less impact on the fields than tractors. “They don’t have compression on the soil,” he said. With 120 acres, the farm has plenty of work for Monty and Rose, Brennan said. “My ideal is to work them morning and afternoon sessions,” he said. So far the horses have been doing all the hay teddings, in which cut grass is fluffed up three to four times daily over a two- to three-day period, as well as basic maintenance like dragging the indoor riding rings and transporting material to fill potholes in the farm’s roads. They also haul manure for land leased by the Many Hands Farm Corps, a Community Supported Agriculture enterprise that brings in teenagers and college students to help work 4 acres at Amethyst Farm. Brennan has learned about horse power from members of the Draft Animal Power Network, a regional association of farmers, and the Fair Winds Farm in Brattleboro, Vt., which has long used horses to power equipment. He has also read books by Lynn Miller, a small-farm owner who has written about haying with horses. Brennan said he is looking for ways to keep Monty and Rose busy throughout the fall and winter. He is considering offering sleigh rides, and may also have the horses pull logs from the woods. He also wants to let young people interested in agriculture see the horses in action. The Many Hands Farm Corps provides an ideal opportunity for that, he said. Morace credits Brennan with demonstrating that a farm can uses horses instead of tractors. “It’s about making students aware that this is not just a dream, but it’s actually possible to run a horse-powered farm,” Morace said.